Faceboook CEO Mark Zuckerberg will oversee a $16 billion IPO, making it the third-largest IPO in U.S. history. NEW YORK (CNNMoney) -- After four months of paperwork, hype and speculation, the last piece of the Facebook IPO is in place: Facebook said it has priced its IPO at $38 a share. At that price, Facebook's IPO will raise $16 billion, making it the largest tech IPO in history. It's the third largest U.S. IPO ever, trailing only the $19.7 billion raised by Visa (V, Fortune 500) in March 2008 and the $18.1 billion raised by automaker General Motors (GM, Fortune 500) in November 2010, according to rankings by Thomson Reuters. There are still a few more steps before Facebook's shares are ready to trade. The company is waiting for the Securities and Exchange Commission to declare its IPO effective -- the formal green light Facebook and its underwriters need before they can sell shares to outside buyers. The $38 IPO price is the rate at which Facebook's underwriters (including lead banker Morgan Stanley) will sell shares to their clients, which typically include large institutional investors, mutual funds and hedge funds. Shares will be released Thursday night to those buyers, who can resell them on the open market beginning on Friday. Some shares were made available to individual investors, but getting them typically requires either a lot of money or a lot of trading experience. It also required moving fast. Many brokerages offering pieces of Facebook's IPO allotment "closed their books" on Tuesday, meaning they stopped taking orders. When can I buy? 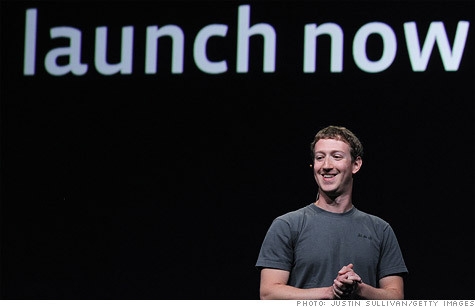 Ordinary investors looking to get a piece of Facebook will have to wait until Friday morning. Unlike Google (GOOG, Fortune 500), whose IPO used a "Dutch auction" to allow direct bidding by investors, Facebook's setup doesn't give regular folks access until shares begin trading publicly on the tech-heavy Nasdaq exchange. While the market opens at 9:30 am ET on Friday, Facebook's shares won't start trading instantly. It typically takes time -- sometimes an hour or more -- for newly listed shares to begin actively trading on the day of their public debut. How much Facebook is worth: Facebook's (FB) market capitalization will hover around $81 billion on the day of its IPO. Who's selling shares: Facebook CEO and founder Mark Zuckerberg plans to sell 30.2 million shares in the IPO offering. That will net Zuckerberg about $1.1 billion. After the offering, Zuckerberg will hold 503.6 million shares, or about 31% of the company. That stake is worth $19.1 billion.